Menthol for Pain Relief : Is This Effective? Menthol, one of nature’s most effective natural pain relievers, can already be found in products throughout your medicine cabinet, purse, and even your pocket. Fully 3,000 tons of menthol are manufactured every year for products like mouthwash, toothpaste, breath-mints, gum, lip balms and on the list goes. Yet menthol really shines when used in pain relief creams. How does menthol help relieve pain? You may know from experience rubbing on a pain relief cream with menthol instantly brings cool, soothing pain relief to aching muscles. What you may not know is how menthol actually tackles pain in three different ways all at once. Menthol has a natural analgesic (pain reliever) attribute when used in lotion, gel, or cream form. As the lotion is applied, molecules called ligands attach themselves to receptors in your cell triggering a change. The menthol ligand attaches to the kappa Opioid receptor, which produces a numbing effect. Another reason menthol works so well when you rub it on those aching muscles is because it triggers a process called vasodilation. Blood vessels in the area widen, increasing blood flow to the area and reducing the skin barrier function. As a result, other medicinal ingredients typically found in that lotion along with the menthol get to work faster while the increased blood flow itself bring nutrients necessary for cellular repair and carry away waste. Finally, one of the biggest culprits behind muscle aches and pains is inflammation. The Latin word for inflammation is inflammare which means “to set on fire.” Menthol brings a wonderful cooling sensation by stimulating thermoreceptors in the skin cells which help your body recognize temperature changes. Your skin doesn’t actually change temperature. Instead, menthol causes a signal to be sent which your brain interprets as cold, relieving the uncomfortable heat of inflammation. 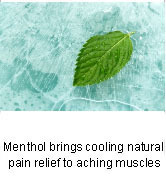 That’s why many first aid products use menthol for cooling in place of ice. Clearly the mint plant gives us much more than good flavoring. It provides one of nature’s most effective natural pain relievers which even speeds up healing. Galeottia, N., Mannellia, L.D.C., Mazzantib, G., Bartolinia, A., Ghelardini, C. (2002). “Menthol: a natural analgesic compound”. Neuroscience Letters 322 (3): 145—148. doi:10.1016/S0304-3940(01)02527-7. Sounds interesting. I will try both ginger and the menthol remedies and see if it makes a difference in my cronick back pain. Great post and the article is really nice and informative. There are many herbal products for curing pain and diseases. Among those herbs menthol is one such products that helps in curing back pain. Thank you for explaining how menthol acts as a pain reliever. Menthol has always been one of my staple medication for pain relief. Just smelling it, sets off an instant soothing feeling. With the fresh mint leaves, do i rub this on my back where the pain is,and would this help.? Also could i make a mint tea to drink.? Does rub with Menthol cause blood pressure increase? I have been using muscle & joint pain relief rub containing 2.5% Menthol for few years already, however lately, my blood pressure systolic number has risen 20 to 25 points. It does help to relief my hip pain effectively but the rise of my BP really worries me. I would appreciate if somebody could shine some light on that matter. Thank you!